A month ago I wouldn’t be able to stand where I’m standing tonight. Impossible. Unless I was willing to share the same physical space with seven other people. I’m looking down at the skating rink at Rockefeller Center. Four weeks ago, thousands of tourists and locals were cramped in and around the small park that encloses the rink. The tree! There was the world-famous Christmas tree, with thousands of lights, in front of one of the entrances to the former NBC Building (“30 Rock”). Tonight, only a few dozen people wandered about taking photos of themselves. Nearly everyone was oblivious to the rink below…there was no one down there. I leaned against the stone wall and took a closer look. After all, this was one of the most iconic New York City sights of them all. I saw a young woman waiting for the Zamboni machine to complete its hypnotic oval loops. She would be the first on the smooth new coating of ice. My mind went back to a night in the early 1980’s. I was in the City with my daughter, Erin. I had just purchased a single ticket and rental skates for her…at a fair price, I may say. The total cost was about $12.00. (Tonight the price topped $40.00.) That night, years ago, was New Years Eve. It was 11:00 pm and this was the final skate of the day…of the year. Erin was first in line behind the chain gate. When the attendant opened the latch, my daughter would be the first onto the ice. At 11:00 pm sharp, the skaters took the ice. Erin skated like the ten-year-old she was, a little awkward, a little unsteady, but full of self-confidence and grace. I was proud of her courage to take such a public risk. If she fell, thousands would watch her hit the ice. These words never left her lips…even if she ever thought about them. Tonight, I had those same fears for this complete stranger On this chilly evening, she had only two sets of eyes watching her. Those of Prometheus. And mine. 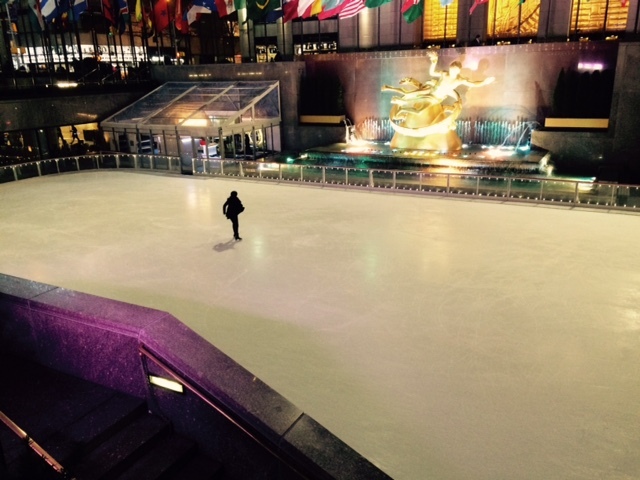 She skated out to the center of the rink, directly toward the gold-guilded god that looked out over the ice. She advanced slowly, like a virgin to be sacrificed. Watching her. Watching the way she moved, I knew she was never looking for the fire from Prometheus, his approval or mine. She was skating for herself. She took her position to begin a long and sinuous trip around the rink. I turned and began to walk toward 5th Avenue to hail a taxi. I didn’t need to see anymore. She had all the attention she needed and it was in her own soul. I glanced back toward the fire-god and the rink. A few cameras flashed. The skater, this woman unknown to me, would end up on a camera roll and later erased or a Facebook post to a cousin in Reno. No, I didn’t need to see anymore. Her first confident steps told me her whole story. This entry was posted in Blogging, Creativity, Everyday Events, Memories, New York City, non-fiction, Objects of Beauty, Real Personal History, Uncategorized and tagged 1980's, 30 Rock Plaza, 5th Ave., daughters, god of fire, ice skating, New York City, Prometheus statue, Rockefeller Center Ice rink, self-confidence, zamboni machine.